Unless you’re a denim nerd, selvedge can sound more like a style buzzword than a must-have. Since we’re bombarded with different fits, washes, brands and fabric on the daily, it’d be easy for selvedge to get lost in menswear’s ever-expanding denim department. That shouldn’t be the case, however. Selvedge denim is defined by the specific construction involved. Shuttle looms, a bit of kit made largely redundant by cheaper, modern alternatives, are used to produce strips of fabric with tightly woven bands to each side to stop the fabric from fraying. This is where the name ‘self edge’ or ‘selvedge’ is derived from. This shouldn’t be confused with ‘raw denim‘, a term that is reserved for fabric that hasn’t been pre-washed. Not that raw and selvedge denim are mutually exclusive, however – many selvedge jeans are not pre-washed, so they can also be considered raw – but if you’re being strict about it the term ‘selvedge’ applies strictly to the construction. And that’s something that’s been going on for decades. In the 1950s, most jeans were manufactured in America from selvedge denim. As jeans became more a fashion fixture than simple workwear, the construction was altered to cater to the mass market (and subsequently compromising the quality). Selvedge started to come back when the notion of heritage stumbled back into the limelight, thanks to a greater desire to clinch the cost-per-wear ratio – after all, cheaper jeans sit lightly on the pocket but usually need replacing every year. With that information to hand, get one of these expert choices straight on your legs this season. American workwear, like most things stateside, is bold. So consider A.P.C. a subtler – and decidedly French – take on a yankee classic. The Parisian mainstay is known for an adherence to clean lines and minimalist shapes, and the selvedge denim range is no exception. Levi’s selvedge denim is more American than comically expensive healthcare. Not only did the label kickstart the blue jeans trend in 1853, the selvedge line of today is just as sharp as the original. While essential, shopping for denim can be quite an uninspiring task. And an expensive one. Cut through the noise (and crippling price tags) with Uniqlo’s selvedge denim, a cost-effective option that doesn’t scrimp on quality. Edwin is the OG of Japanese selvedge – a fabric superior to most thanks to vintage Toyoda looms that reinforce the denim. What’s more, the 70-year-old outfit was the first in the world to start ‘stonewashing’, an achievement that bodes well for its contemporary wares. Don’t be deceived by the Scandi HQ. 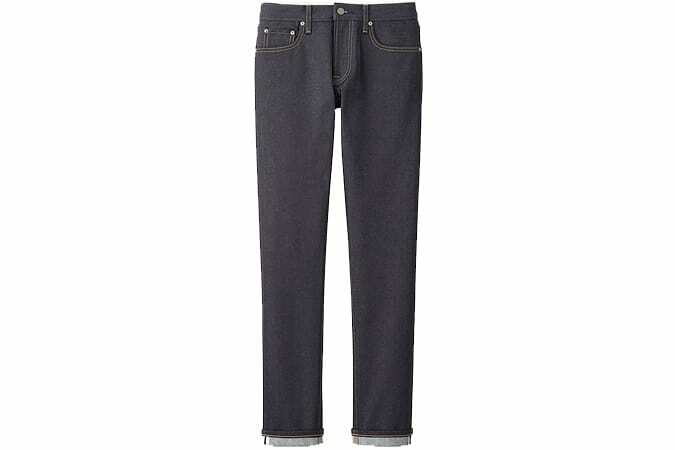 Acne Studios looks to all parts of the world in the pursuit of a perfect pair of jeans, using homegrown Swedish design to repurpose an American stalwart with the finished article made in Italy. Maria Erixon, founder of Swedish label Nudie Jeans, believes denim should be a dynamic piece – something that develops character with every wear. To that end, each pair of jeans come complete with dyes that change shade over wear, alongside a fabric that’ll gradually morph to your shape for added comfort. Carhartt didn’t just popularise American workwear, it pretty much invented it. So take sweet relief in the Rust Belt brand’s WIP line – a collection that melds Michigan function with Milanese streetwear sentiments. John Lewis shouldn’t be discounted as the place your mum gets her bathroom rug. For years, the British stalwart has crafted a range of quality selvedge denims that give the regular high street a run for its money – on all fronts. In brand terms, Albam is just 11 years old – pretty much a teenager. What it lacks in heritage, however, it makes up for in quality. Every pair of selvedge denim jeans is crafted in Portugal, one of the up-and-comers in elite manufacturing, with numerous alternatives to standard indigo. They may share a name with the call of travelling gypsies, but Rag & Bone is a permanent fixture in the menswear scene. The New York label adds city cool to New England threads, resulting in a line that’s repurposed, old school Americana for the modern dresser.